I suppose some may think this sacrilegious, but dang, doesn’t that big clown have pipes! And the band is pretty slick too. If you’ve been around this blog for a while, you’ve seen this clown before. 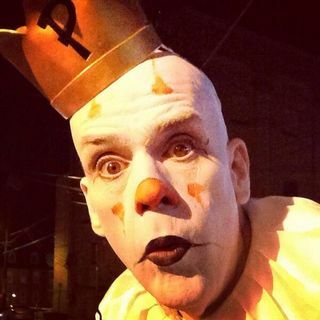 Now I’ve heard some folks complain that the singer here does not need this “gimmick” to make an impression, but understand that Puddles, the Sad Faced Clown is just one of many gigs that Big Mike Greer has going on. Singer, musician, actor, announcer, he keeps pretty busy without the costume and makeup. Click here for more on Big Mike. According to my private pianist and partner, Brian, this is not an easy song to play or to sing. You can learn more about the story behind it here. This video was posted to YouTube on the 24th last year, but I hadn’t stumbled upon it until late December, so I saved it to come back to for this year. Happy Christmas! Nice voice and excellent sing. Thank you.